FEA$T (Funding Emerging Artists with Sustainable Tactics) is designed to generate support for ambitious concepts initiated by area artists. It's a community-driven dinner with all the proceeds funding a single project that might not happen otherwise -- crowdfunding the arts right here in Omaha. FEA$T is based on multiple successful micro-granting models around the country. 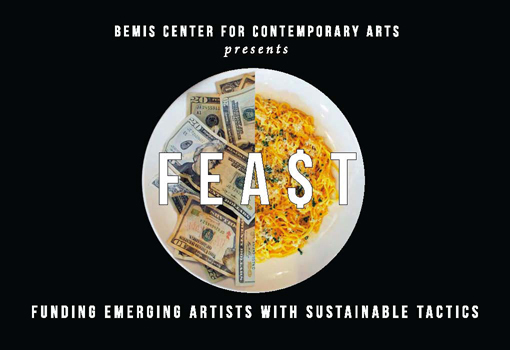 The event FEA$T consists of a dinner, during which 5-7 pre-selected artists give brief presentations about a future project that requires funding. After the presentations, the diners will vote and the project that receives the most support will receive all ticket proceeds from the event. The winning artist will present the results of their project at a future FEA$T event. Artists working in any media are encouraged to submit applications to FEA$T. The proposals will be judged on concept, originality and potential community impact. Project proposals with ties to Omaha, Council Bluffs, Lincoln and the surrounding areas are preferred but not required. The Bemis Center would like to thank Abigail Satinsky, InCUBATE and Sunday Soup, FEAST Brooklyn and all other participants in the Soup Network for their hard work and support. APPLY TO PRESENT YOUR PROJECT AT FEA$T! So far, FEA$T has funded projects with $3,783.51.